Q&A: What does Israeli production of first 3D printed heart mean? A 3D printed heart presented to the world on Monday by scientists at Tel Aviv University is sparking global interest. Here we aim to answer the some of the more common questions about this breakthrough and its implications. How can a printed heart beat inside a human being? All the components of a printed heart are from the patient’s body. Fat tissues are taken during a biopsy and turned into the “ink” with which the heart is printed. The “ink” is based on biomaterials genes and sugars coming from the patient themselves. No ingredient is artificial. Will a printed heart be a match for every patient? The answer is no because for the body to accept the heart without needing further medication, doctors must implant only tissues from the patient, which will match the heart. How to print a tissue? There are three dimensional models created after CT or MRI scanning of the heart. The models then go through a computer and from there to a printer that prints thin slices that form the new heart. 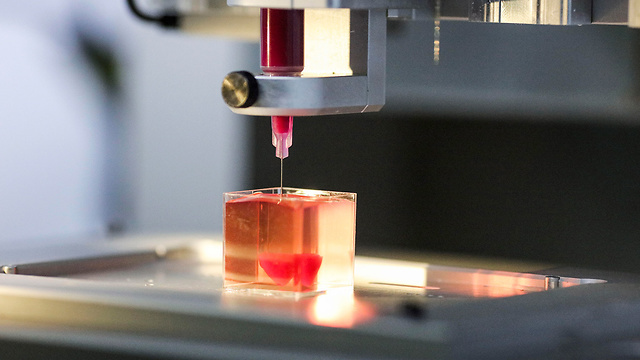 Printing the 3D heart at Tel Aviv University How long can this heart last? Too early to say but the cells are very young, like embryonic stem cells, so the heart may have a longer life than a heart taken from a dead person. Will heart disease no longer be a cause of death? Theoretically, it will no longer be a cause of death, but again it is too early to determine. It is possible that scientists will be able to create any organ in the body in this way, and anyone who suffers from heart problems will be able to get a heart transplant. The goal of organ printing – in which a lot of money is invested – is to treat diseases and prolong life expectancy. However, this does not mean that science will ensure eternal life – certainly not for the foreseeable future. When will transplants using printed organs be performed? In the next year or two, the first transplants will be carried out, apparently on rabbits and rats, subject to additional laboratory experiments. It is too early to estimate when such a heart will be implanted in humans but with no particular problems in the way, the process will take about 10 years. What color is the heart? The heart is transparent, but the researchers use food coloring to make it easy to distinguish between the heart and its blood vessels. In the models presented, the heart was painted red and blood vessels blue. Theoretically it is possible to implant a heart in any color. How can heart problems be detected? The researchers are working on further development – a combination of electronics and tissue that aims to obtain information from the heart and allows the doctor to provide treatment when there is abnormal heart activity. The assumption is that the heart will become anatomically correct and so in the event of a problem, cardiologists and surgeons will be able to treat patients without the need for special training.